It's been more than two months since I took Kate McKinnon's workshop on boxes and birdhouses. I'm finally trying to complete one of the pieces I started there. This is one of the pieces that came out of the kiln there with the major glitter effect. Luckily, it seems to have brushed out just fine. 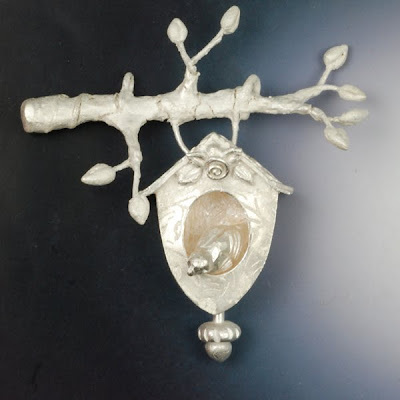 It was interesting to note that the fine silver wire that connects the movable bird to the finial at the bottom was also glittery, confirming that the glitter effect has nothing to do with silver clay per se, but rather just silver surfaces crystallizing at a higher than recommended temperature, with a bit of nucleation help from the vermiculite bedding. One of the most useful techniques I garnered from Kate was using wire armatures for metal clay. I have used wire inserts for connectors and the like, of course, but really thinking in terms of an armature with a skin of metal clay opens up so many possibilities! It has its own issues, too, as you can see if you check the branch carefully. There are cracks in some places that need to be filled and shrinkage has made the wire underneath obvious in others. Nothing that another bit of work won't fix, but it gives me a better feeling for how to work the next time. The branch was just an obvious extension of the surface branches I do on my own work, so I couldn't resist. It appears that my leaves are stable and the fine twigs are movable. Of course, being that fine may not make this the sturdiest piece of work, but it was a useful learning piece. I'll repost when I get the repairs finished and the patina added. You are right, the glitter effect is certainly not limited to MC; it's runaway grain growth in the fine silver from excessive temperature. I figure that their lampworking kiln must have reached 1700; it's unfortunate. Sterling responds to excess heat by alloy separation; far worse than a bit of glitter. If you don't want any cracks in your branch, use a thicker layer of MC for your alloyed skin. Branches tend to have cracks in nature- I generally go with it. One nice effect is to go with the cracks for the first firing, then wrap a second alloy skin, and refire. That way you get the topography of the cracks, without actual cracks. So, I've learned that you are a chemist, Vickie. Could you fill in a few more details on your chemistry background? A lovely piece, Vickie. Haven't tried sculptural pieces but am considering it now.